. 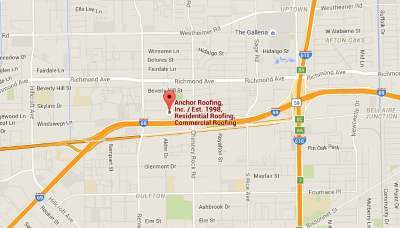 Houston Shingles Roof Company | Anchor Roofing, Inc. Looking to put Shingles on your Houston home? Shingles are the most popular choice when it comes to picking a roofing material for your Houston home. They are usually made out of all kinds of materials such as metal, plastic, flagstone, wood, slate, asphalt and composite material. It is important to have a beautiful home and what another way to achieve that than to utilize roofing material that will leave people without words? We will guide through most common types of roofing shingles available on the market to help you decide what roofing type is the best choice for your home. Asphalt shingles are most common roofing choice n this country because they are relatively easy to install and are economically priced. You can find coated shingles that meet the ES standards (Energy Star). Three-tab roofing shingles are somewhat less expensive and are thinner than architectural of laminated asphalt shingles. Another thing to consider when opting for asphalt shingles is their lifespan. Asphalt shingles may be less expensive, but they will last only about 20 to 25 years with proper and regular maintenance before replacement. Wood shingles are more pricey than asphalt shingles. They are one of the more aesthetically appealing roofing materials available on the market today because they posses that natural look. If you opt for a redwood or cedar which are hardwood, your shingles should last anywhere from 30 to 50 years if adequately and regularly maintained. Slate shingles are particularly popular in northern states because slate is dug out of quarries there. This material is extremely durable, and they can last 50 years or even more. There are slate roofing systems that are older than a century and are still leak free without needing repair services. The thing with this roofing choice is that it is expensive. If your financial situation doesn’t allow you to install slate roofing system, you can always go for an alternative. There are synthetic slate roofing materials available on the market that are visually almost identical to slate but are shorter in duration. This roofing solution is most suitable for homes that have a steeper roofing style. Metal can be industrially cut into shingles and can be economically priced if you decide for a cheaper option like a galvanized steel or metal, but it can last up to half a century. Metal shingles are becoming more popular for residential roofing options. Tile shingles are unique visually. They are common in the colonial style homes and The Southwest region of the country. These shingles are one of the most expensive choices you can go for when it comes to picking a roofing material for your home. They are also costly to install, but they will pay you back with their durability and long lasting lifespan. Tile shingles can easily last up to 80 years if you take proper care of them and maintain them regularly. Besides the price, they are somewhat heavy, and that means that your home should have a sturdy roofing support structure that will be able to withstand their weight. Now that you have some more information about various roofing materials it will be easier to opt for one that is best suited for your needs. For any additional information, contact us or visit our homepage. Our contractors install, replace, and repair shingles in the Houston, TX area, including Katy, Sugarland, Missouri City, Pearland, Spring, Cypress, Galena Park, Richmond, Rosenberg, Stafford, The Woodlands, Baytown, Clear Lake, Galveston, La Marque, Pasadena, Deer Park, Sealy, La Porte, Brookshire, and Columbus.